Conflict without end – India and Pakistan? INDIA and Pakistan are implacable foes whose long history of suspicion and mistrust for the other are bound to boil over again into violent conflict, even possibly nuclear annihilation. For most people outside the subcontinent that’s more than a common view. 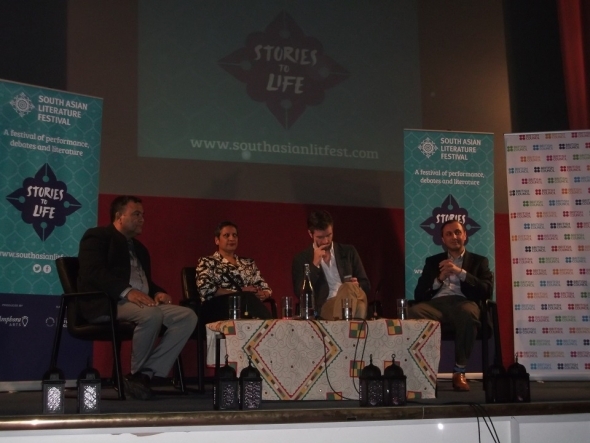 But anyone who knows anything about these two countries and attended a session at the recent South Asian Literature Festival would be struck just how much common ground there is between both countries, in what was one of the most sharply focused discussions of the nine-day fest. There was considerable insight, intelligence and much mutual understanding (perhaps a little too much?) in ‘Reporting Across Borders – India and Pakistan’, which saw the experienced journalist Declan Walsh (second from right), once of ‘The Guardian’, now of ‘The New York Times’, (but unable to return to Pakistan because of visa issues at the time of writing), share his expertise and trade opinions and thoughts with Rahul Kansal (left), a senior executive from the Times of India Group, and Farooq Bajwa (far right), author of a newly published book, From Kutch to Tashkent; The Indo-Pakistan war of 1965, and a Lahore-raised Pakistani human rights lawyer based in London with links to ‘The Jang’ newspaper. The two newspaper groups joined hands in 2010 to form ‘Aman Ki Asha’ – an initiative designed to break down barriers between the two peoples and facilitate more regular types of contact between them. What emerged from the debate is that despite both sets of people sharing a lot in common with each other: language, food, and many cultural practices – the mass media often vented deeper prejudices and concerns. For the Pakistani army and parts of its establishment, India remains the No.1 enemy, whereas for most ordinary Pakistanis, the main country of hate, now is the US. Walsh said this was reflected in a new glitzy Pakistani film called ‘Waar’, which depicts the army battling militants – but these opponents are not inspired by radical Islamist ideas or the terrorism of Al Qaeda – they are in the pay and play of the India’s intelligence service and while it was credible to believe India might want to stir internal tensions, explained Walsh, it was a stretch too far to think they funded the most violent and radical of terror groups based in Pakistan. “Many suspect the film has been financed by Pakistan’s ISI (its intelligence service),” said Walsh. On the other side, many Indians had little idea of what goes on in Pakistan and are not exposed to its media unlike Pakistanis who can access Indian satellite TV quite easily; and India too has not been adverse to using popular films to depict a crude anti-Pakistan message. “The view in India of Pakistan has become myopic,” said Kansal. Walsh felt general relations between the two “were as bad as they have been in recent times” because of the violence on the country’s borders close to disputed region of Kashmir – but these deadly skirmishes did not necessarily upset the uneasy stand-off there appears to be in Islamabad and New Delhi. There was a consensus that Kashmir as a political issue between two countries has slipped down the agenda, largely because Pakistan is far more preoccupied with its battle against terrorism and its own relations with the US. Equally, there was a feeling that both countries could do much to improve trade, and abolish ‘silly’ regulations as a way of building momentum and trust for the future. Kansal said a random event could still scupper tentative moves towards further dialogue and stronger business links initiated by Pakistani prime minister Nawaz Sharif and he later told www.asianculturevulture.com that since the 2009 Mumbai terror attacks, there was little popular appetite for dialogue or reform of India-Pakistan relations. Wide-ranging in scope, the discussion was well moderated by Shreela Ghosh, the director of Arts South Asia, at the British Council, which co-hosted the debate at the University of Westminster on October 26. Ghosh raised a laugh when she declared Lahore her favourite city in South Asia – “I love saying that in India”, she said.